Very early in the Book of Mormon, Lehi the prophet has a vision. He sees “a tree, whose fruit was desirable to make one happy.” This tree lies at the end of a path marked by a rod of iron. Lehi makes his way down the path, holding fast to a rod of iron because of a great midst of darkness, and partakes of the fruit of the tree. 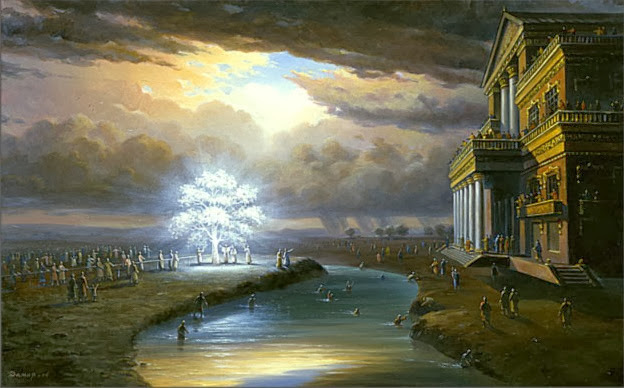 Three chapters later, Lehi’s son, Nephi, is shown the same vision, and gains an understanding of the meaning of the things described in Lehi’s vision. The tree represents the love of God, more specifically the atoning sacrifice of Jesus. The rod of iron represents the word of God, or the scriptures and words of the prophets. The great and spacious building represents the pride of the world. Second, many of these people who were once on the path, and many who even partook of the fruit of the tree, or in other words, experienced the love of God, fell captive to social pressures from the people in the great and spacious building, so much so that they wandered away from the tree. There is too much pride in the world. We are allowing ourselves to be influenced by too many outside sources, too many great and spacious buildings filled with people that attempt to pull us away from the love of God, and the relationship we develop with Him as we strive to keep His commandments. As changes in society’s support towards unmoral and ungodly trends increases, so does the pressure put on those who choose to follow traditional and biblical doctrine. Many members of the Church have questions and concerns, even doubts about their faith. Consequently, many give in and choose a separate path rather than the one that leads toward the tree. To those who are struggling with questions, concerns, or doubts – Don’t give up. It’s okay to ask questions. It’s asking questions that opens doors for answers and potentially strengthen our faith. The ways of the world are constantly changing. God’s truth hardly ever overlaps with the trends of society. The ways of the world will continue to change, but God’s ways will never change. Don’t conform to the ways of the world, the trends of society. Rather, allow the love of God and the gospel of Jesus Christ to transform you into the very image that God created you to be – His. The picture used in this post, is there a print of it that one can buy? Sorry, I don’t remember the source. There are many beautiful renditions, though. One of my favorites is Greg Olsen’s work. Here is a link.